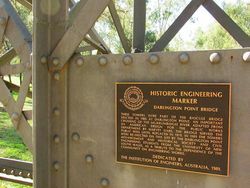 An Historic Engineering Plaque commemorates the Darlington Point Bridge. 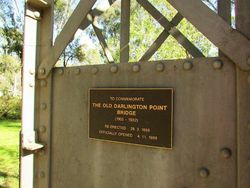 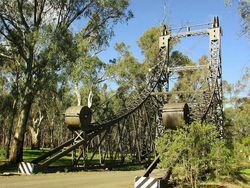 The towers of the old bridge were reconstructed for the Australian Bicentenary celebrations and officially opened on the 4th November 1989. 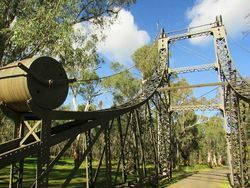 THESE TOWERS WERE PART OF THE BASCULE BRIDGE ERECTED IN 1905 AT DARLINGTON POINT, AN IMPORTANT CROSSING OF THE MURRUMBIDGEE RIVER. 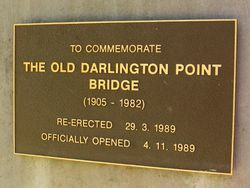 ADAPTED FROM AN AMERICAN DESIGN FOR THE PUBLIC WORKS DEPARTMENT BY HARVEY DARE, THE BRIDGE SERVED THE PUBLIC WELL UNTIL REPLACED IN 1979. 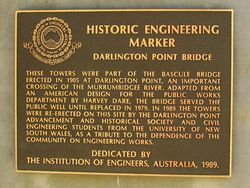 IN 1989 THE TOWERS WERE RE-ERECTED ON THIS SITE BY THE DARLINGTON POINT ADVANCEMENT SOCIETY AND CIVIL ENGINEERING STUDENTS FROM THE UNIVERSITY OF NEW SOUTH WALES, AS A TRIBUTE TO THE DEPENDENCE OF THE COMMUNITY ON ENGINEERING WORKS. DEDICATED BY THE INSTITUTION OF ENGINEERS, AUSTRALIA, 1989.